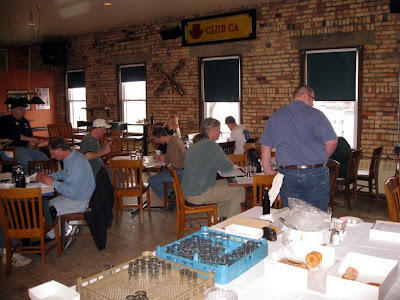 Paris and I were in Green Bay this weekend to judge at the Titletown Open Homebrew Competition. 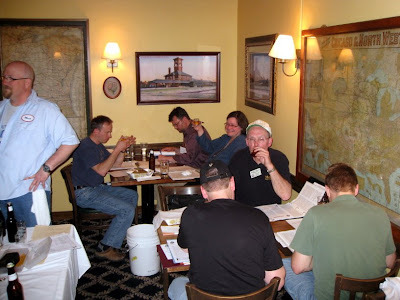 We've been fortunate to attend the past eleven of their fifteen events, ever since my first year at Egan Brewing. 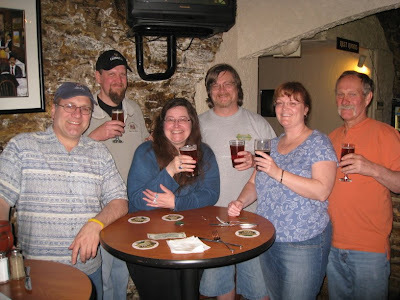 Before the first night's judging, we met some friends in Appleton at Stone Cellar Brewpub. 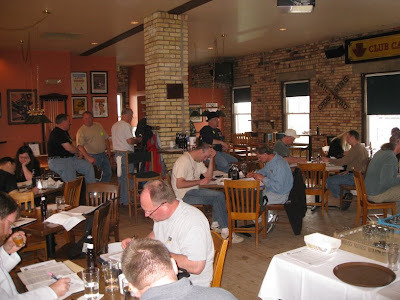 The Titletown Open, held at Titletown Brewing, set records this year with 159 entries and 20 judges over two days. There were a lot of great beers entered this year. The Best of Show winner was a magnificent Eisbock. I gave it 45 points out of 50, the first time I've rated a beer that high at a competition. I noted that while it wasn't EKU 28, it was at least EKU 23. Last week didn't go according to plan. Not even close. But then that seems to be the rule rather than the exception. I had planned to brew three or even four times; I brewed a batch of All American Gold on Monday, and that was it. The yeast wasn't active enough on Tuesday to kräusen a new batch, so I worked on my brewery record-keeping software instead. I got a root beer order from Lincoln to be delivered on Thursday, so I spent Wednesday filling kegs, and dumping the disappointing Maibock. A busload of people came in for a not-really-a-tour; instead of actually walking through the brewery, they just wanted me to talk about what I do around here. I forgot to mention that I ran out of root beer on Wednesday, so I had to steal some from the pub's tank Thursday morning before hitting the road. I picked up 1300 pounds of sugar Friday morning, and made 14 barrels of root beer Friday afternoon to fill the two empty tanks in the cellar. Also, my Weyermann Rauchmalz arrived, so I need to schedule the brews leading up to the Smoked Doppelbock. I probably should have brewed some Tin Lizzie Hefeweizen today, but the remaining 800 pounds of sugar was still in the brewhouse, so I made 21 barrels of root beer instead. A gasket failed on one of the holding tanks, and a barrel and a half or so ended up on the floor by the time I fixed it. Tomorrow I'll clean the draft lines and brew the Hefeweizen. Wednesday I'll clean and fill kegs. No plans for Thursday yet. Friday, Paris and I are going to Green Bay for the annual Titletown Open Homebrew Competition. If you happen to be in Appleton, Wisconsin this Friday afternoon, come have a beer with us at the Stone Cellar Brewpub! So I haven't posted anything about A Brewer's Life since ... (looking back) ... late February, it seems. So rather than catching up all the mundane details — and they have been mundane — I'll just provide the current state of the brewery and beers, and try to start again. What's on tap? Seven beers, which is probably one too many. The Dunkelweizen is showing its age, and the Stout and Amber aren't moving at all. What's in the tanks? Not a whole hell of a lot. Of the eleven fermenters, two of which are only used as holding tanks for root beer, ten are empty. The eleventh contains this year's Stüvenbräu Maibock, which didn't ferment out, and which is tasting pretty tart, and which I'll probably dump out early next week. What's coming up? The problem with the Maibock seems to be that I underpitched the wort. So before I brew anything special again, I need to build up my yeast stocks. I figure that if I brew three beers on consecutive days, pitching each wort with kräusen beer from the previous day's batch, I can harvest one tank for future beers, and harvest the other two to pitch into a single strong beer. I'm leaning toward that strong beer being a Rauchbock. 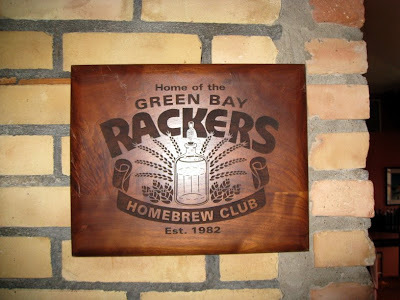 So next week, I'll probably brew a Gold, a Brown, and a (don't know yet), then brew the Rauchbock two weeks later. Which means I need to order the smoked malt, like, today. What else is coming up? KJ gave me a list of beers he'd like me to brew. So, yeah, that oughta keep me busy for a while. I'm just wondering who we're going to sell all this beer to.